Just before my breast cancer diagnosis (so no relation, honestly), Anthony reads the related books The China Study and Whole and suddenly decides to adopt a whole-grain, plant-based, near-vegan diet. Within a week, the girls cry -- actual, literal tears streaming down their faces -- when Anthony brings out a quinoa salad and roasted vegetables to the dinner table. "No more quinoa! No more lentils! My God, we need real food!" Springtime in Paris may get all the songs, the glamour, and the love, but there's something pretty special about autumn in Paris, too. It's not New England, I admit. But you can get splashes of some pretty stunning color against the black-and-white backdrop of the city. 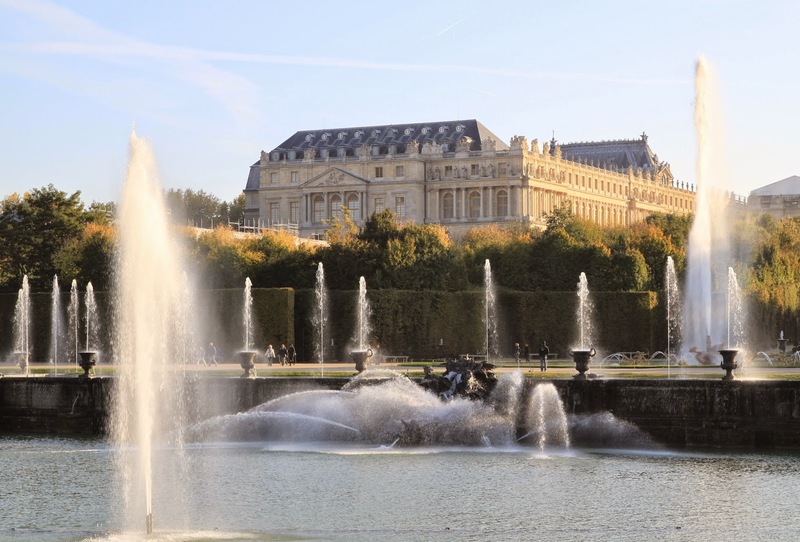 One day over October break, we go to Versailles with some friends visiting from San Francisco, starting our day there with the equestrian show at the stables across from the palace. Naturally, the stables themselves are fit for a king (and not just the king's horse). But the show....how shall I say this delicately?....is not quite designed for American tastes. For the first 45 minutes or so, there are three riders on horseback traversing in vaguely pattern-like paths around and through the ring. A sleep-inducing, floridly-written voice-over recites drivel like "A horse and rider become one through the years. 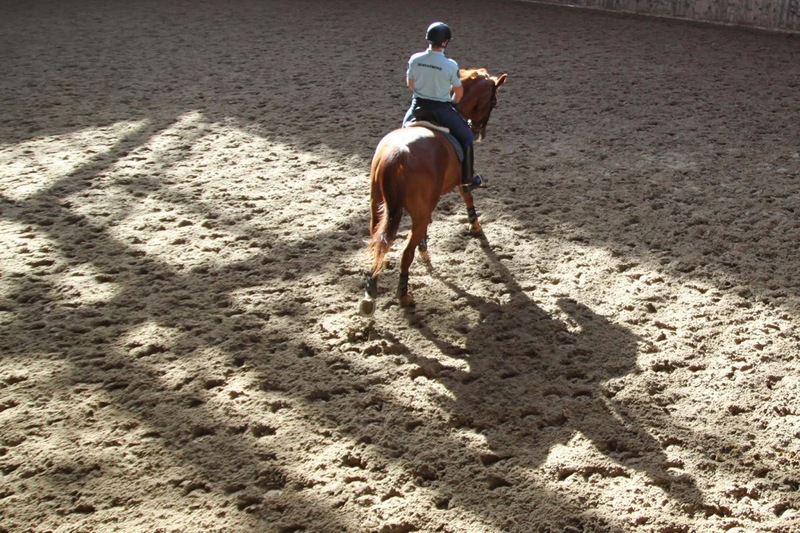 The rider is not his master, but a part of the horse, and one cannot exist without the other. When a horse dies, a part of his rider's soul also perishes, and he must work for years to rebuild this rapport with another horse, who will someday be just as much a part of his soul." I keep hoping I will not be able to understand the next thing they say. Sacrilege Alert: About 40 minutes in, our friend Cindy leans over and whispers to me, "Matt just asked me, 'Do you think everybody here is wondering when the real show is going to start?'" It's hard to know if we are just American and crass, and therefore we are the only ones hoping a horse dressed in sequins will play the piano like Liberace, or if, in fact, everybody is yawning on the inside. For the last ten minutes, the riders get the horses to do extremely un-horse-like things such as walking backwards, sideways, and most bizarre of all -- skipping. 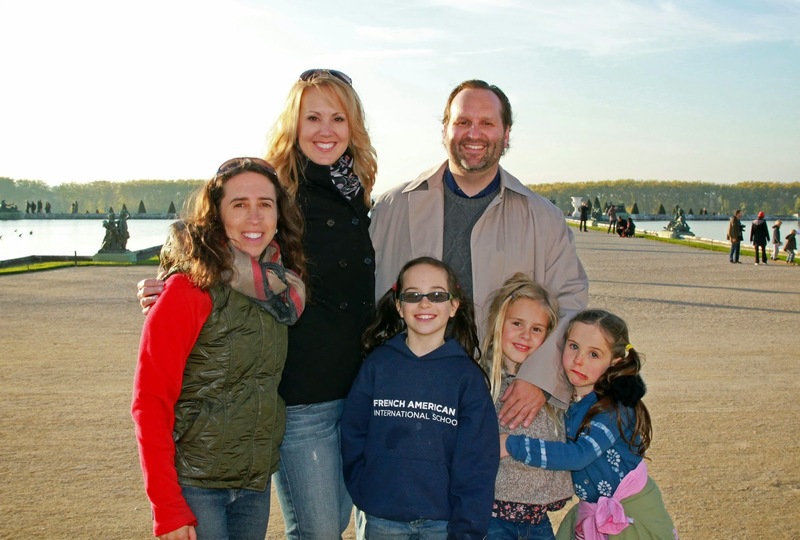 We four parents are desperately trying to rev up the excitement level for the children: "Wow! Look at the horses skipping!," but really the children by now have given up and are far more interested in plowing through the copious snack supply I've brought. We emerge an hour later, poorer and wiser. Perhaps 400 years ago this was as addictive as television ("Maman, please just 15 more minutes of horses skipping?! I promise I'll clean my room after...."). We are foregoing a visit to the interior of the palace itself (I know: Sacrilege Alert! ), but one of the nice things about living here is not feeling like we have to do it all in one day. We'll make it inside before we leave, but today, we head out to the gardens. At one point, Pippa is lost in her own world and goes the opposite direction from us. Though we can clearly see her, we scream her name, and we are on a big open almost un-peopled path, she doesn't notice for quite a while that she is getting farther and farther from us. She likes to walk along, head in the clouds, making up songs and monologues/pretend conversations. Here in the gardens, she finally does snap to, but she thinks she is lost and starts bawling. Are we terrible parents because we let her believe herself lost for quite a while, in order to teach a lesson? 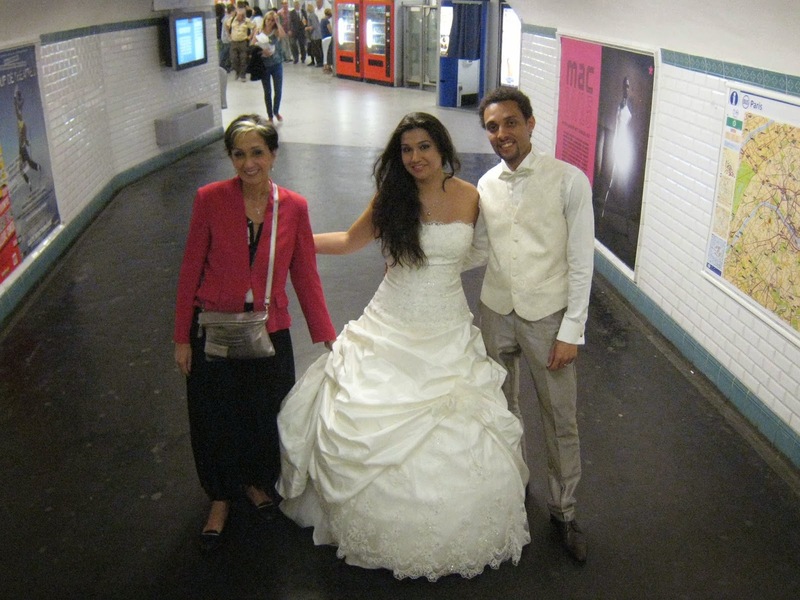 In Paris, she has gotten lost a couple times because of this habit. Somehow this feels like a pretty safe place for her to learn this lesson. Or, perhaps we are ogres. Don't worry; eventually we go and get her. The fountains are all in full spray this month for a couple hours late in the afternoon. Disillusioned by our horse show this morning, we set our expectations low. "Remember, this won't be the Bellagio fountains in Vegas!" 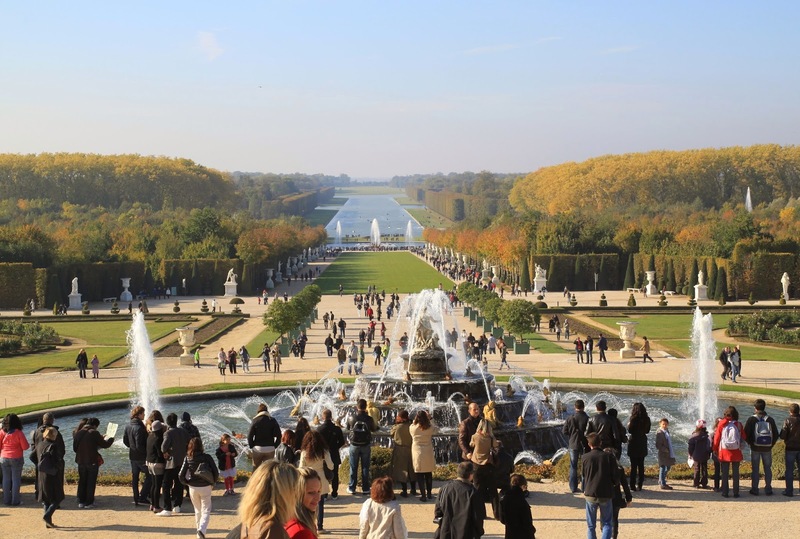 While it's true that many of them are just simple fountains, some are "choreographed", and all are set amidst the splendor of gilded statuary and mythical carvings in the beautiful surroundings of the Versailles gardens. There is classical music broadcast throughout the garden, the sun has finally warmed up, and we are not watching horses prance. So, all in all, a lovely afternoon. Since Cindy works in advertising, and we are all American, we cannot help but notice the incredible lack of branding and salesmanship. We start choosing the best real estate for kiosks that could sell King Louis IVth reproduction antique i-phone covers and beautiful backdrops for 10€ photos taken with somebody in full Marie Antoinette costume (before she was beheaded, she and husband Louis XVI being the last of the royal line to reside here). 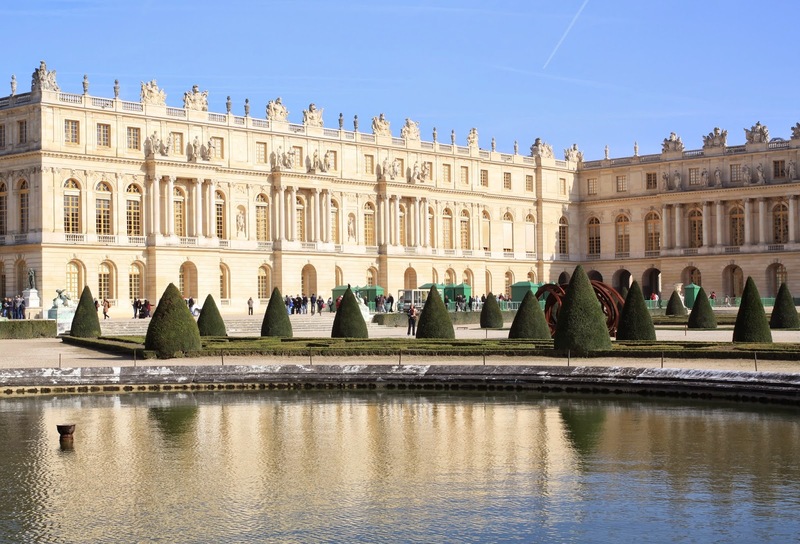 Naturally, chances for sponsorship are horribly lost on the poor French, who simply present the castle in museum-like dignity. 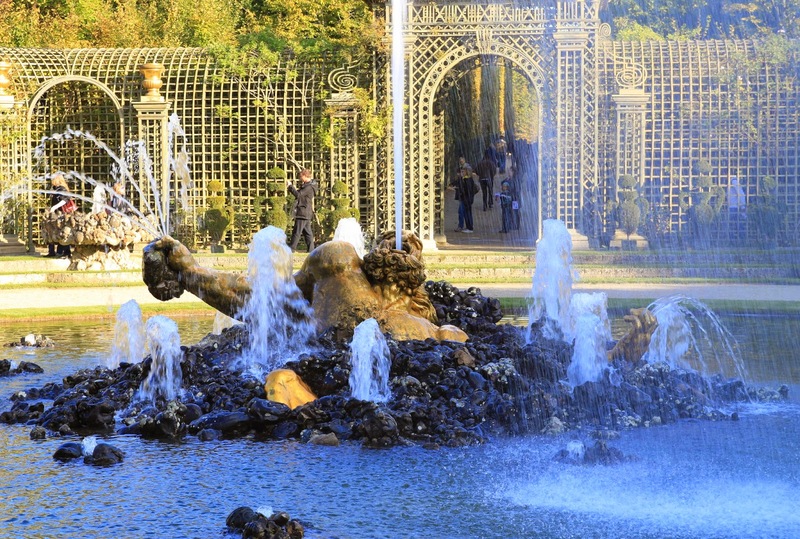 The Fountains of October, brought to you by Evian Water! 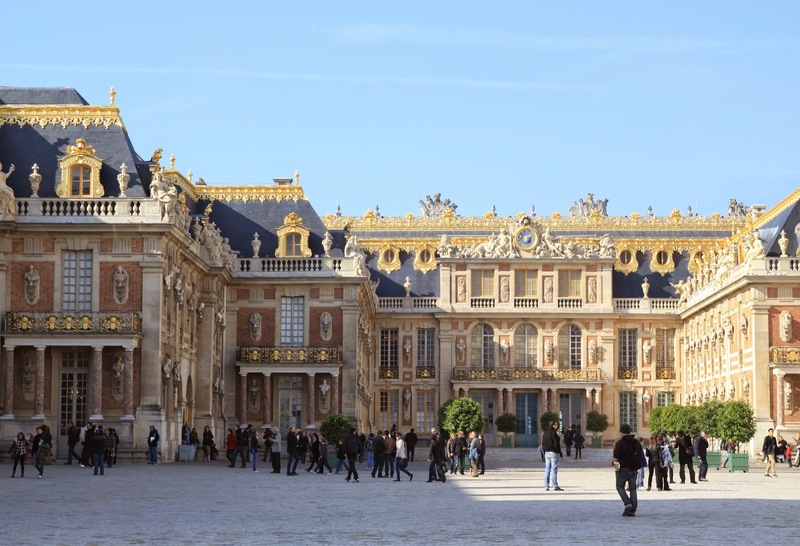 Versailles, brought to you by Louis IV, the Sun King, and Sunny D -- a delicious fruit-flavored drink! Sigh. What a missed opportunity. This posting also brought to you by Pepperidge Farm (new motto: "Let them eat cake!"). Les Gachons, mysteriously labeled Fleuron des Gachons by my market cheesemonger, is from Saint-Léger-sur-Vouzance, a commune in the department of l'Allier in the region of Auvergne in central France. That's a mouthful of a description for a mouthful of a town-name for a small nubbin of cheese. It's a farmhouse cheese made from raw goats' milk with a lovely layer of ash through the middle, and hints of ash coming through the wrinkly toad skin crust. 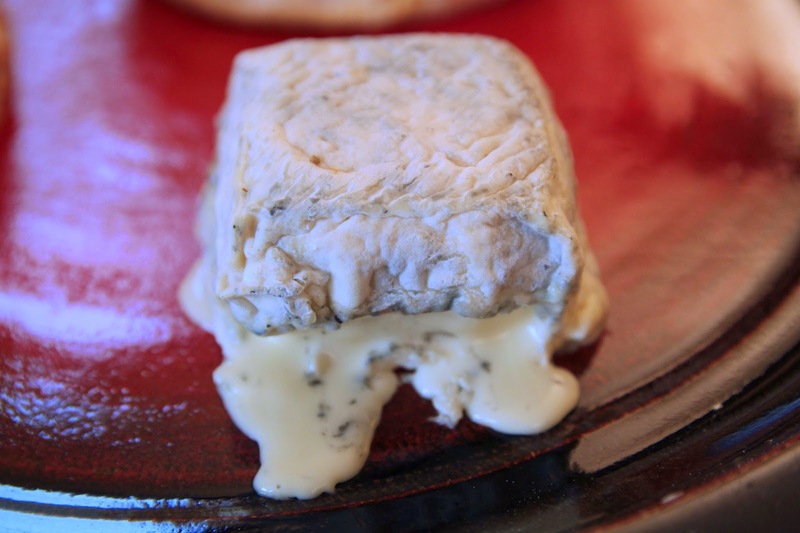 It's a creamy, mild cheese -- milder (yes, blander) than you'd think given the black streaks. Ash is all sound and no fury. But it's hard to argue with the texture: seemingly a solid when cool, and a liquid at warm room temperature. It's positively goopy. In any event, some people actually prefer a very mild goat cheese, without the game-y, farm-y taste. And those of us who like a little more oomph can always add a jot of honey or a fruit gel. 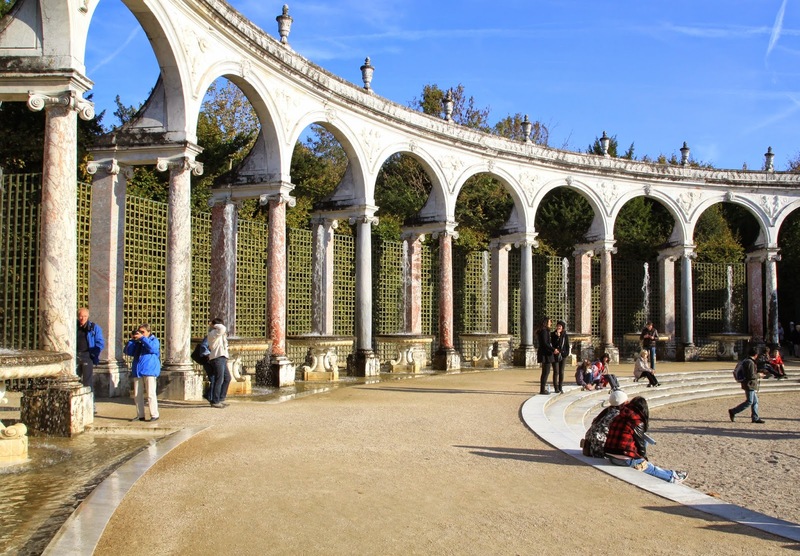 This posting with its gushing fountains is also brought to you by the letter G, found on the gilded gates at the entrance to Versailles: G which stands, of course, for Gachons. And funny enough, the word "Gachons" can also mean "Let's Waste!" or "Let's Spoil Somebody!" -- which brings us right back to Louis XVI, Marie Antoinette, and the mythical-but-probably-not-true pronouncement, "Let them eat cake!" It's almost Halloween for some of you. For the French among you, it's almost All Saint's Day. And for the Hispanophones, it's almost Day of the Dead. No matter how you look at it, it's a spooky time of year, and so I figured I'd show you the easiest, cheesiest way to spook people with fromage. Some are scary because, amoeba-like, it looks like they're trying to ooze their way out. 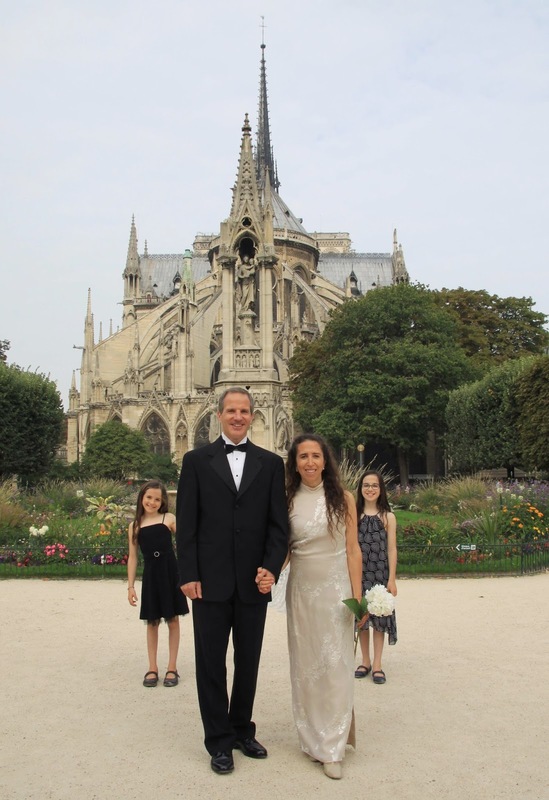 By coincidence, one of my college friends (design/antique expert Jacqueline Wein), whom I'd lost touch with during our child-bearing years, also named her youngest daughter Pippa. And what happens when you re-find old friends and get two silly Pippas together? A level of squealing, giggling, and jumping at volume levels you cannot imagine, unless you have a your own pair of peppy Pippas (or other giddy girls) hanging around. Their noble goal for the evening: to taste every single thing on the table, no matter how disgusting. In France, as in much of the world, October is Breast Cancer Awareness month. I have to say I'm feeling extremely aware because on October 1st -- poetically the first day of what the French call "Octobre Rose" or "Pink October" -- I was diagnosed with breast cancer. Who could forget the great Horse Meat Lasagna Scandal of 2013? Perhaps only the dead horses themselves. Interestingly, one of Paris' few, remaining horse butchers, Chevaline Chaussier in the 13th arrondissement, actually saw a rise in the number of clients and purchases as a result of the scandal. People were, simply put, curious. My record, achieved on a recent Tuesday morning walk, is seeing six wedding portraits within one hundred meters of each other. 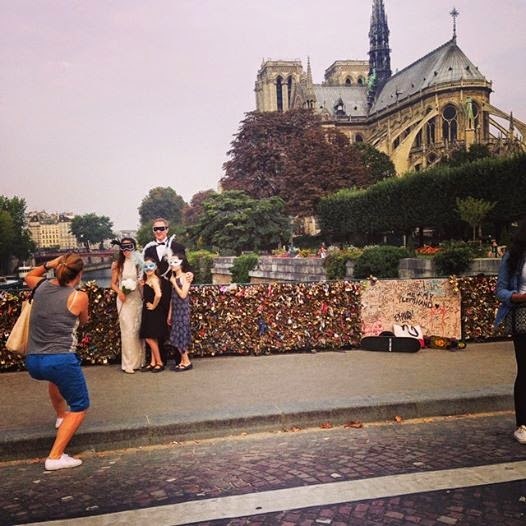 Welcome to Part II of the story of the Love Locks Bridge: We are besieged by brides and grooms primping and posing for their glam wedding photos. 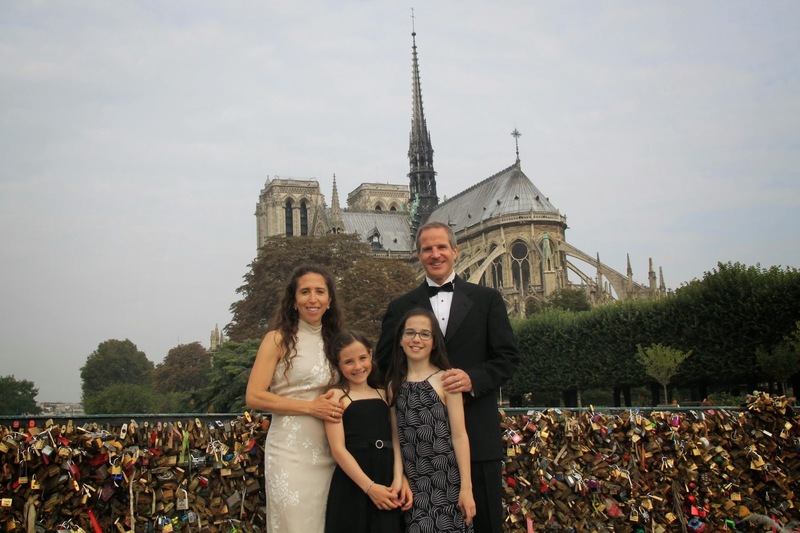 Unsurprisingly, the most popular spot is in front of the love locks, with the full view of Notre Dame in the background. 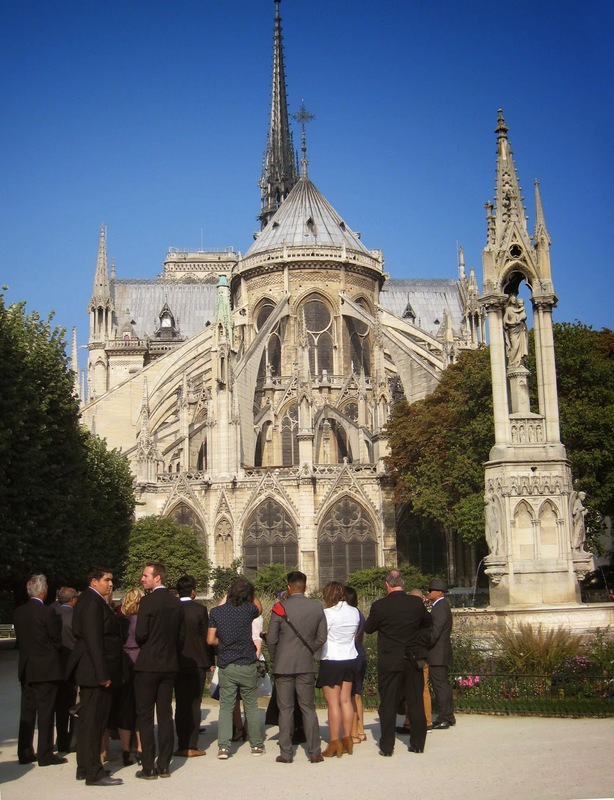 Sometimes the party moves inside the garden itself for close-up Notre Dame views. 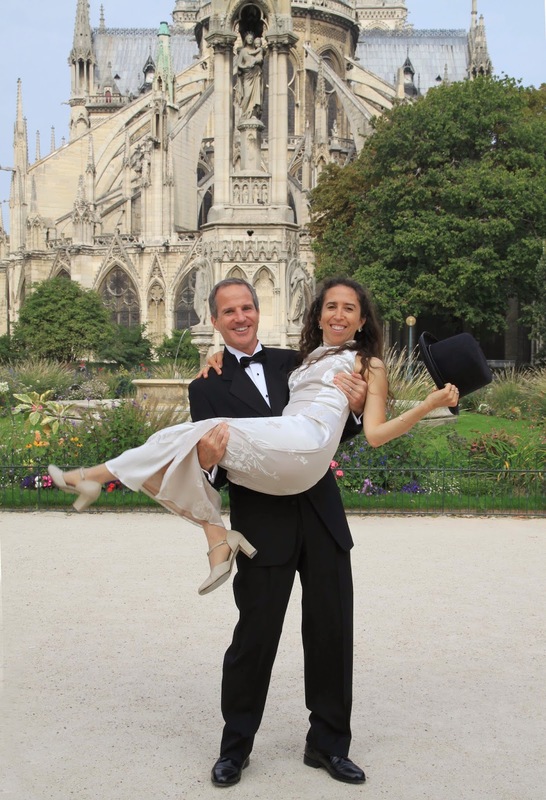 And once, we see not just the wedding photo but the wedding itself (and no, this wouldn't be the official wedding in France, as that must be done by a civil servant at city hall or some such spot). 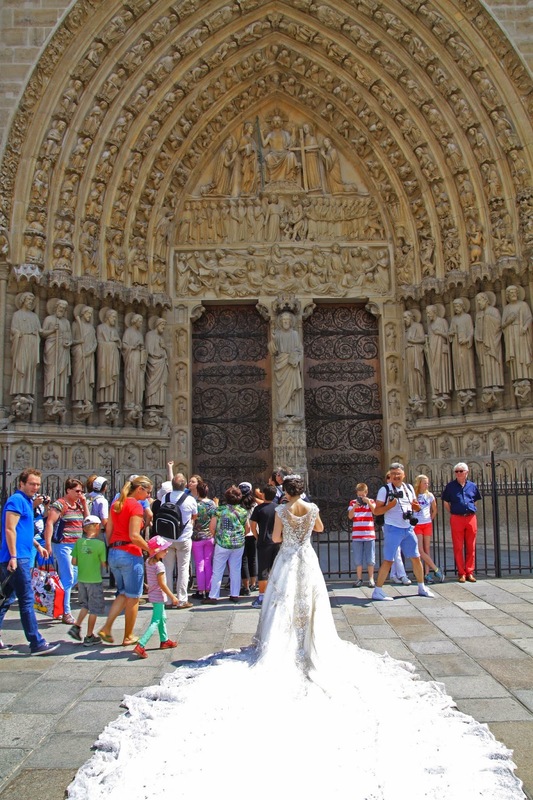 More unusual, but no less spectacular, is this bride on the front side of Notre Dame. 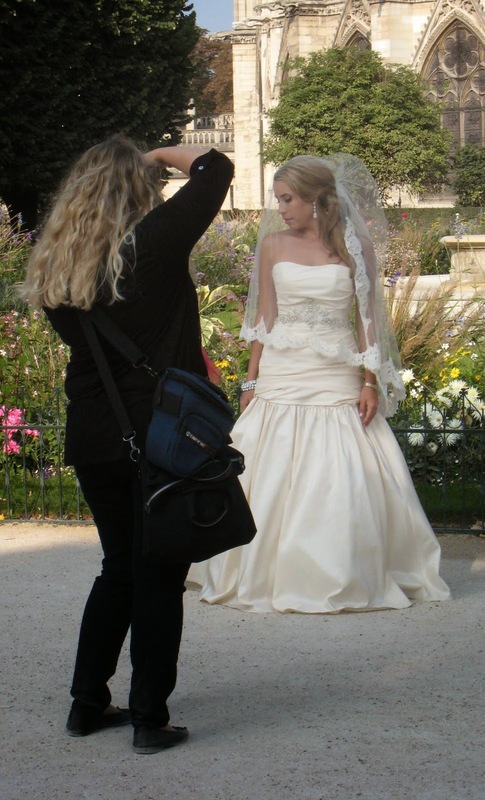 This barrage of brides and glut of grooms means, of course, that we also see them hanging around the neighborhood prepping for photos, taking photos in other spots, or just taking a break from photos. The smarter ones, in my mind, get where they need to go in sneakers, carrying their high heels. 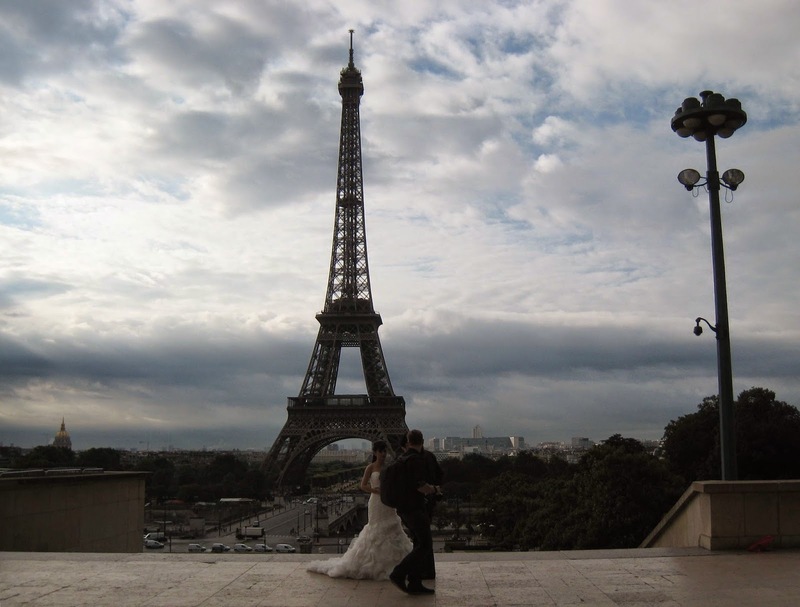 Another hot spot, you will not be surprised to hear, is the Eiffel Tower. But since I'm rarely over there, I have fewer photos of this in my wedding collection. From the Pont Alexandre III, newlyweds (or about to be newlyweds) can get a nice view of the Eiffel Tower, and it's a beautiful bridge to boot. Now you didn't really think I would let this go without joining in the fun, did you? Is it just me, or does Anthony look like a silent movie star? If so, I feel the message in the photo below is quite clear. 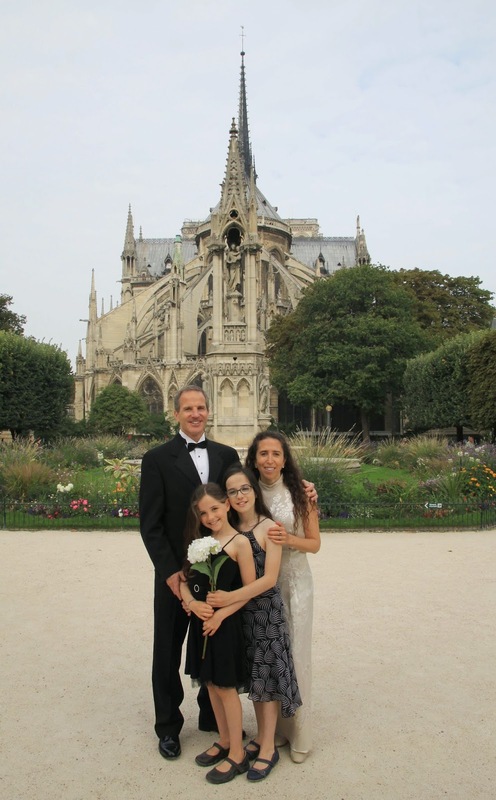 The original plan is to have my Dad (who knows his way around a camera) do the shoot, but Anthony is scheduled for shoulder surgery just before my parents get to Paris. So instead, we call a friend on a Sunday who comes down with a coffee cup, grabs our camera from the girls' hands and shoots for us. One of her daughters comes along, and shoots a photo of her taking photos. Taking a picture of somebody taking a picture of somebody.... that's a classic in the family I grew up in. 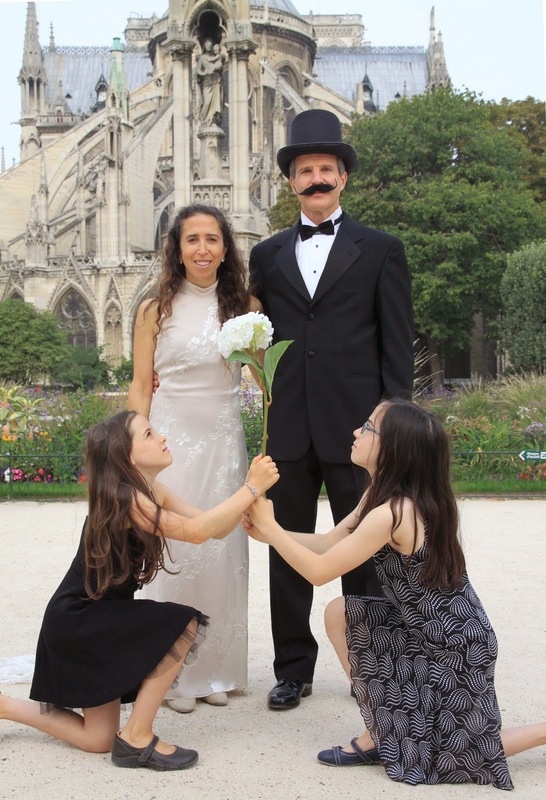 Apparently, our family just can't take ourselves, or the wedding photo situation, too seriously. 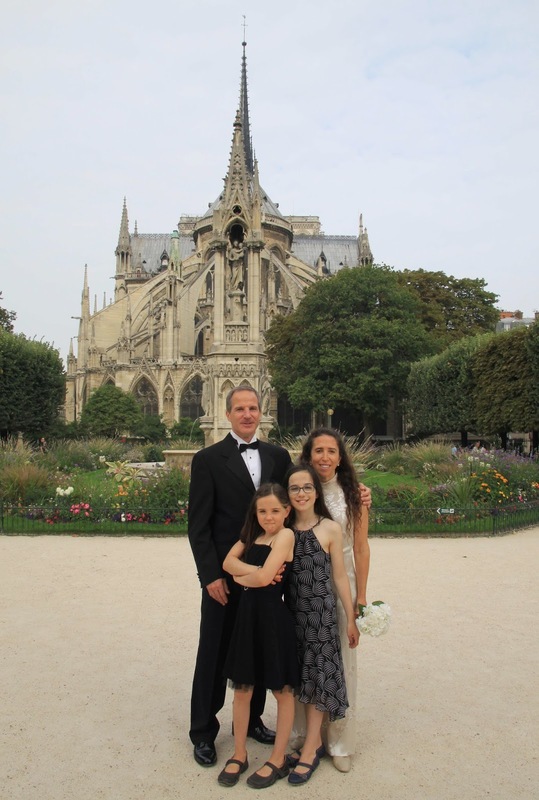 In the garden behind Notre Dame, we take a nice one, and then one that shows Pippa's true personality. Most of the brides we see doing photo shoots are Asian, but for some mysterious -- and I'm sure completely coincidental -- reason, literally right after Anthony and the girls and I go out and take our wacky wedding photos, we suddenly see a slew of non-Asians taking portraits as well. 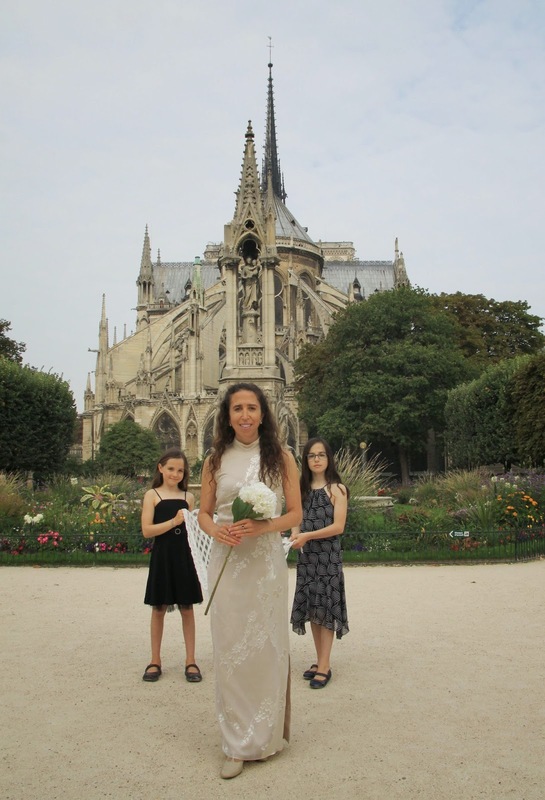 And, just in case you're wondering, that is my actual, real wedding dress. 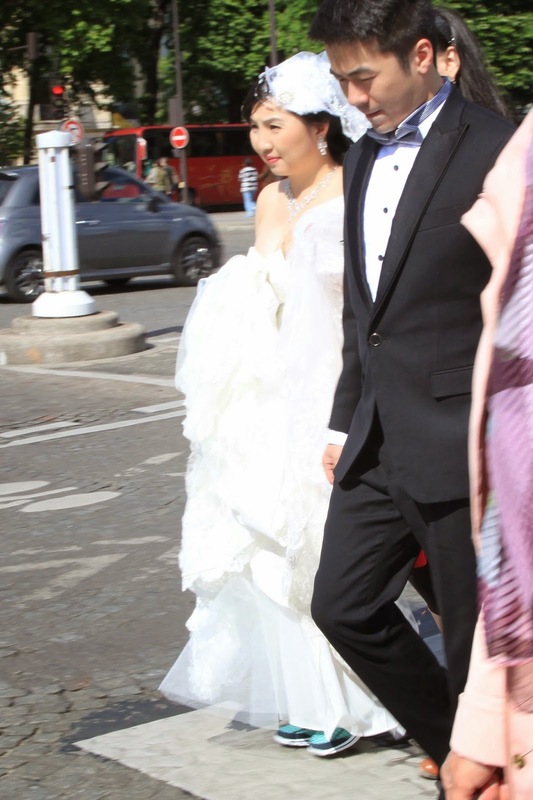 The irony of the fact that most of the Chinese brides are dressed in classic Cinderella gowns while I got married in a Chinese-style qipao (also called a cheongsam) is not lost on us. 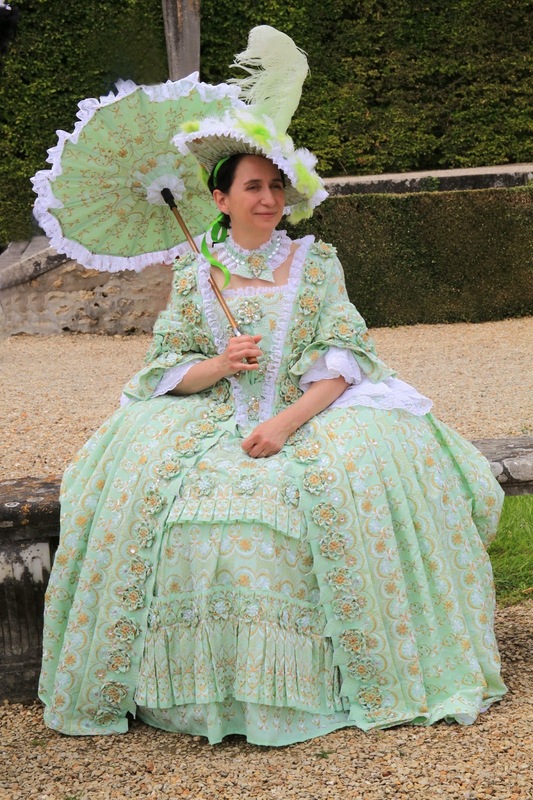 And yes: I do, in fact, move around with my wedding gown, because I also use it as a "regular" dress for formal occasions. This rare, hard-to-find raw goats' milk comes from Deux-Sèvres in the Poitou-Charentes region. In my mind, that's enough to recommend it right there. I invariably find Deux-Sèvres goat cheeses to be of excellent quality. This one is a small batch farmhouse cheese found in the elite Laurent Dubois store, and it doesn't disappoint. An oozy, creamy, melty, silky moldy donut of a cheese (the best kind of cheese, according to the children, Anthony, and myself), Anneau du Poitou -- which is probably really Anneau de Poitou, but my cheese shop has spelling problems -- is lightly speckled with a deep black ash. It's in the shape of a ring, hence the name "anneau" which means "ring" (a band, not a bejeweled ring). The toad-skin crust is fine and delicate and just barely manages to contain the inner ooze, which wants to burst out Incredible Hulk-style. Needless to say, these are best eaten when fresh and soft. If you see this cheese, grab it while you can! Today is Anthony and my 15th wedding anniversary, so it seems just the right time to show you some of the best of my collection of brides and grooms, and our own photos (which we took a month ago, because a) we knew Anthony would be in a sling now and b) the chances of great weather are iffy in late October). The reason I choose this cheese is not just because I love it ("if you love it, why don't you marry it? "), but also because it's an anneau -- that is, a round ring with no beginning or end. A "ring" is a "bague" in French, but a round, plain ring of this style is called an "anneau". Lord of the Rings, for example, is translated as "Le Seigneur des Anneaux". More specifically, an anneau used as a wedding ring is called an "alliance".